6 Billion U.S. Dollars, that is mucho zeros, $6,000,000,000.00 and your tax dollars, hard earned tax dollars. This is the amount that your State Department while under Secretary of State Hillary R. Clinton can not, will not account for, it is still lost. The corrupt significance of this picture is nobody, that means nobody in the media is asking the former Secretary of State, “Where is the missing $6,000,000,000.00 that has been coughed up (pun intended) under your watch?” How the HELL can $6 Billion dollars just vanish? Answer: Hillary Clinton that is how. Hillary Clinton and Slick Willie (and you can include Chelsea) have been robbing this country long enough under the false guise of their foundation. Is this where the money is? Is this why the Obama administration stopped an investigation of the Clinton Foundation? Will Hillary share the wealth with Obama, Lynch and Comey? Hillary accused Trump of keeping his tax returns from the public because we may find he isn’t as rich as he claims. So what! Was the investigation of the Clinton Foundation stopped so We the People didn’t find out the Clinton’s have more than they even claim, funds they can not justify earning; stolen? The Clinton Crime Syndicate is the greatest con job in the history of the United States. Wake up America! Somethings really just gotta be shared! Peter Schweizer, the author of “Clinton Cash” has admitted to some errors in the book, about 20 of them. Given there are thousands of points made and facts, 20 errors “ain’t half bad”. Twenty errors out of one thousand attempts in the major leagues gets you a multi-year, multi-million dollar contract and in the Hall of Fame. The fact is, this book is more than likely spot on with truth about Clinton Cash (mostly from the Clinton Foundation) otherwise there would be a law suit against Schweizer and the publisher in this sue happy nation. The Clinton’s don’t miss opportunities to make a buck. But in this case they can’t, even if some of the facts prove to be false. A law suit would draw more attention to the book, the facts, facts the Clinton’s want secret. They would have to prove the facts to be untrue……..which obviously they couldn’t do either, they’re true. 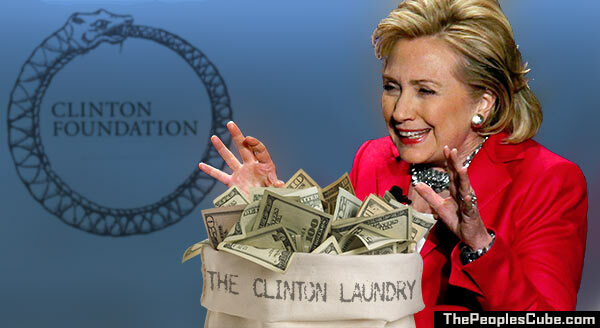 A law suit could drag more irons out of the fire, more info on the Clinton Foundation and donors, with promises exposed. With the Clinton’s all that is bad can and usually gets worse. The Clinton’s just don’t want to talk about it. When asked about their Foundation and the Donors during Hillary’s tenure as Secretary of State, her response is usually “I am very proud of what the Foundation has accomplished.” Bill’s response pretty much the same. Like everything else, the Clinton’s will wait for the issue to just fade away.